Journalist/author Wallace Baine (left), and Santa Cruz County Supervisor John Leopold were among the many community members attending the preview event. 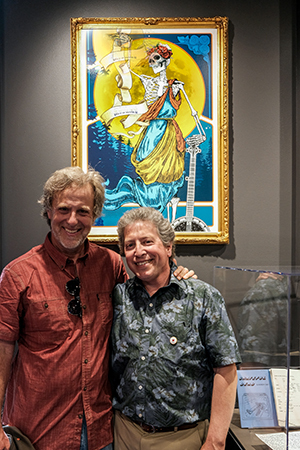 Put Your Gold Money Where Your Love Is, Baby: Counterculture, Capitalism, and the Grateful Dead is the title of a new exhibition now open to the public at UC Santa Cruz’s McHenry Library. This year’s annual exhibition examines how the band invented, improvised, redefined, and pioneered business practices that revealed new ways of thinking about work, about being in business, and about the relationship between creators and their communities. Drawing on newly processed business records of the band from the campus’s Grateful Dead Archive, the exhibition can be found at the Brittingham Family Foundation Dead Central gallery space, located on the library’s main floor. Admission is free during regular library hours. 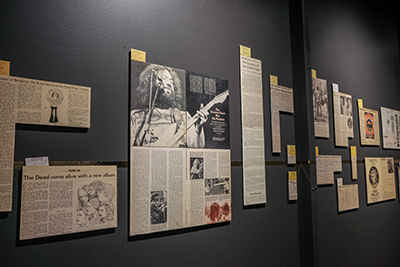 Last week, the library hosted an exhibition preview and celebration to mark the 10-year anniversary of the Grateful Dead Archive at UC Santa Cruz. Band members Bob Weir and Mickey Hart officially made the announcement of the donation of the group’s archives to UC Santa Cruz back in 2008, at a press conference hosted by the campus at San Francisco’s historic Fillmore Auditorium. “Over the last 10 years, researchers, fans, and the general public have come to the UCSC Library to use the Grateful Dead Archive on a regular basis, and our yearly exhibits in particular continue to be a great draw,” said University Librarian Elizabeth Cowell, addressing the attendees in Dead Central at the preview event. 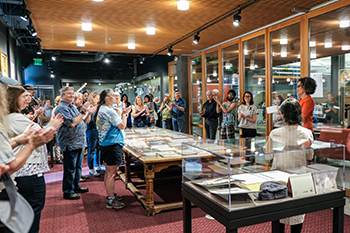 Jessica Pigza, the Outreach and Exhibits Librarian for UCSC’s Special Collections and Archives, noted that the Dead Central exhibition space is a foundational part of a larger effort to make the University Library’s collections more visible and utilized by a greater number of people. She added that the library shares its collections with galleries on campus, and also loans materials to museums across the country and around the world. 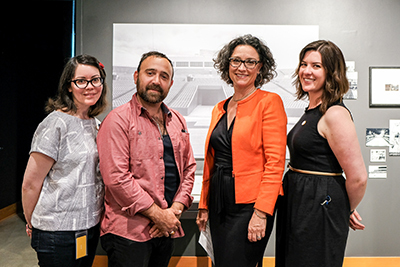 “Putting together an exhibit like this one is so much fun because we get to share what’s in this archive, to reveal stories of how the Dead and their staff invented their own future when it came to being a band, being a business, and being a community,” said Pigza. Cowell also said that she was particularly excited that the library has increasingly been able to integrate the Grateful Dead Archive into the academic work of the campus. She told the assembled guests that Melvin Backstrom was recently appointed by the Arts Division as the first Michael Bonanomi Foundation Visiting Lecturer in Popular Music. “Following in the footsteps of our ethnomusicology legend Fred Lieberman, Mr. Backstrom is bringing two courses to campus during the Spring Quarter: “The Grateful Dead and the Long 1960s” and “The Collective Improvisational Practices of the Grateful Dead,” Cowell noted.